Well, we had a really fun evening last night. Just hung out together as a family. We ordered a pizza, rented some movies from the RedBox (really cool because they are just a dollar), went for a walk and then came back in to watch Old Dogs (not so good) and New Moon (I got soo sweepy so we decided to watch it tonight--don't tell me how it ends!). I think I loved our walk the most. There are no houses behind ours, just a big park with a wide sidewalk all the way around it. The girls love it and always run ahead of us slow folks. But it gives Eric and I a little time to ourselves while entertaining them at the same time (ya'll should try it). Here lately we have had some really good talks as we have been hashing out life in general and what's to come in the next few weeks. We are excited to get things underway next week and find a semi-normal routine in it all. He and I have always loved our time together, but it seems like since his cancer diagnosis, we've become attached at the hip! It's a silver lining. Anyway, enough of "clouds and bunnies" and onto my card for today's Sketch For You to Try from our one and only Jen del Muro. I am more often than not caught saying "Hola" instead of hello, just because I think it's fun. 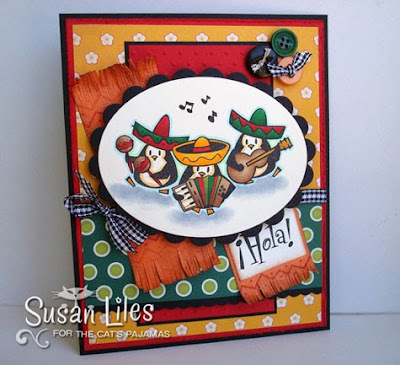 So when I saw this soon to be released set (April 13th), Hola Tequila from The Cat's Pajamas, I squealed to finally have a stamp that said the same thing! 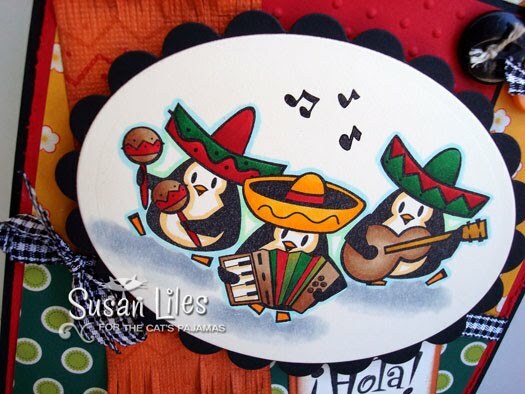 I added the penguin mariachi band with it, changing the circle to an oval, and used a little creative license with the orange panel, making it sort of a Mexican pancho thingy with the fringe. This set and ALL four other ones coming ya'll's way next week are so FUN! We'll be having a blog hop on TCP Tuesday (yes, I'll be on time for this one) to give ya'll some more previews of the stamp sets. And yes, it WILL be "clouds and bunnies" all over again! 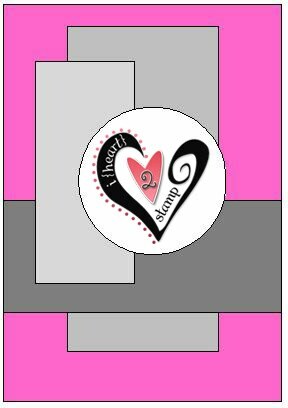 SUSIE Q-TIP: I had to make this card an odd size to accomodate the image and all the "stuff" on it. I hereby give ya'll permission to do the same. Finished Size: 4.75 x 6"
Aye, que chula! Me gusta mucho! Love it!!! I must have this set! So cute! Fabulous card! The details are incredible. Great card and a good chuckle at your Spanish! Awesome card. I am so glad that you and Eric are having together time. With everything that goes on in our day to day it's wonderful to reconnect and remember why you love each other. This card screams FUN, Susan!! Love it! super cute card! sending all our best thoughts & prayers too!